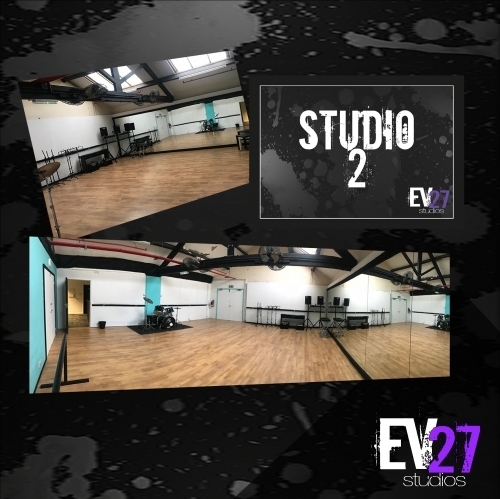 EV27studios has a variety of high quality studio spaces available to hire. Dance and theatre rehearsal space is available for up to 40 people per studio, and specialist band rehearsal spaces are available for band of up to 15 people. The studios have an extensive waiting area, refreshments available and an entrance reception area. EV27studios also offers a variety of Musical Theatre, Drama, Dance and Music Tuition classes. A full timetable is available on our website. EV27studios is based in LS27, just a 2 minute walk from Morley Train Station and main bus routes. By car the studios are just 5 minutes drive from the M1/M62/M621, there is a car park on site for up to 20 vehicles. A variety of musical theatre, performing arts, drama, dance and musical instrument classes available on weekday evenings and weekends. Suitable for all ages. Up to date timetables available on our website. Dedicated dance and music rehearsal space available to hire per hour. Dance space suitable for up to 40 people inc. full PA system, piano, ballet bars and chairs. Music rehearsal space suitable for bands up to 15 people, includes full backline and PA.